Oh how I hate it when my browser breaks down and makes me rewrite stuff (et tu, Firefox...). Anyway: vector of Chihiro and wooden part of bathhouse done in Illustrator with corrections in Photoshop, background in photoshop with stockpicture for sky, sea and cityscape (found at stock xchange). Hope you like it! Constructive criticism always welcome. edit: due to some helpful comments and suggestions, I have updated to version 2. Mainly made some adjustments to lighting and the text. Oh wow! I absolutely love it! So much enhancement from the original scan! Great work! +fav! the background seems a bit grainy in contrast with the vector (which was done quite skillfully) and one almost wants the glow of the city to be white and not a slight yellow as it is; but other than that a charming wallpaper. Wow....the far off city and the vector is really well done. 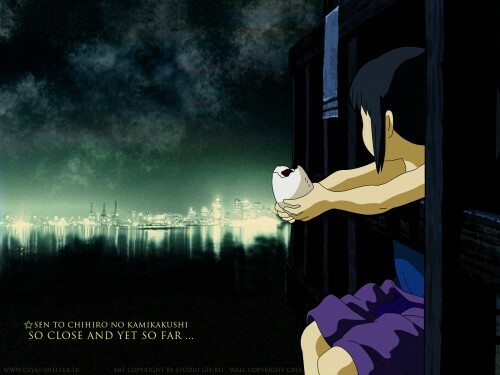 I love Spirited Away and it's actually a bit werid because I just finished watching it. You did a great job on it! This wall is just magnificent. It's been a long time since I was really moved by an anime pic. This one has something more. Thank you. THAT IS ONE NICE WALL! This is very pretty. I always like this part of the film. this anime movie is amazing, its one of my favorites. I like the contrast and lighting. good taste, thank you so much! I am collecting Miyazaki's works for a photo wall in my living room. p.s. I am 40 years old and I still love his works.